Drikung Kyobpa Jikten Sumgön (Tib. འབྲི་གུང་སྐྱོབ་པ་འཇིག་རྟེན་གསུམ་མགོན་, Wyl. ’bri gung skyob pa ’jig rten gsum mgon) aka Ratnashri (Skt. 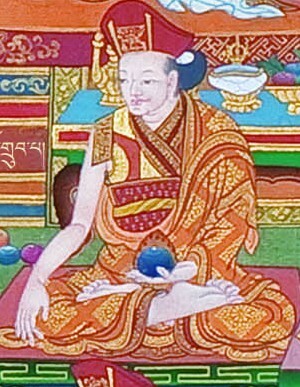 Ratnaśrī) (1143-1217) — one of the eight main disciples of Phagmodrupa Dorje Gyalpo and the founder of the Drikung Kagyü tradition. He also received the transmission of the Kagyé from Nyang Ral Nyima Özer, who gave him the name Ratnashri. [The Drikung Kagyü school] was founded by Kyobpa Jikten Sumgön, who was called the One Who Perfected Interdependence. He established Drikung Monastery, and he is renowned for having 180,000 students. Most famous of these are the three siddhas Nyö, Gar, and Chö, as well as Drikung Lingpa. ↑ Ringu Tulku, The Ri-me Philosophy of Jamgön Kongtrul the Great (Boston & London: Shambhala Publications, 2006), page 141. ↑ aka Drikung Thil Monastery (Wyl. 'bri gung mthil dgon pa), or Changchub Ling (Wyl. byang chub gling). ↑ aka Gar Chödingpa, the First Garchen Rinpoche; see Garchen Tulku Incarnation Line. ↑ aka Sherab Jungné (Wyl. shes rab 'byung gnas) (1187-1241). This page was last edited on 31 March 2018, at 18:47.